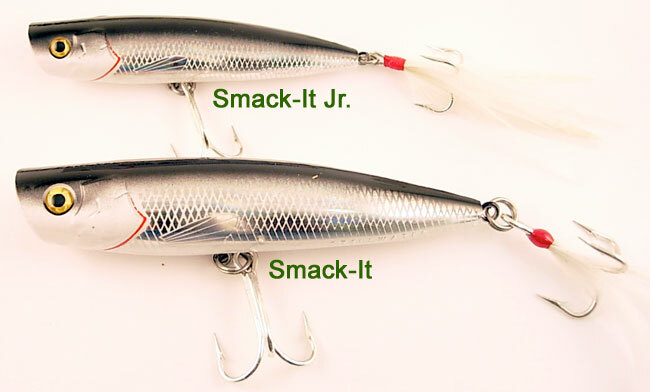 Stillwater Lures presents the Smack-It and Smack-It Jr. Topwater Popper Baits. These lures could very well be the most effective striper fishing plugs on the market. Made of high quality components at an affordable price, Stillwater lures is committed to bringing you the very best value in the industry! The Smack-It measures in at 5 inches in length and weighs 1 & 1/4 oz. It’s baby brother, the Smack-It Jr., is 3 & 3/4 inches long and weighs 3/4 oz. Both baits have the weight you need to get those long casts, but they still float with ease. The Smack-It works well when casting from the beach or from a boat. The Smack-It Jr. is ideal for back bay fishing for schooling stripers and blues. Other features include 3X strong Mustad hooks and finishes that will hold up to the toughest of conditions. Even the holographic finished baits will not chip or peel. Perhaps the most unique aspect of the bait, and one that sets it apart from the rest, is the distinctive rattle that will attract all kinds of gamefish. The Smack-it has a reputation for bringing in the big stripers, but it also works on bluefish, largemouth and smallmouth bass and musky, just to name a few. Made in the USA with the highest attention to detail, you’ve got to try one today! Dealer Inquiries are welcome! Contact us here.